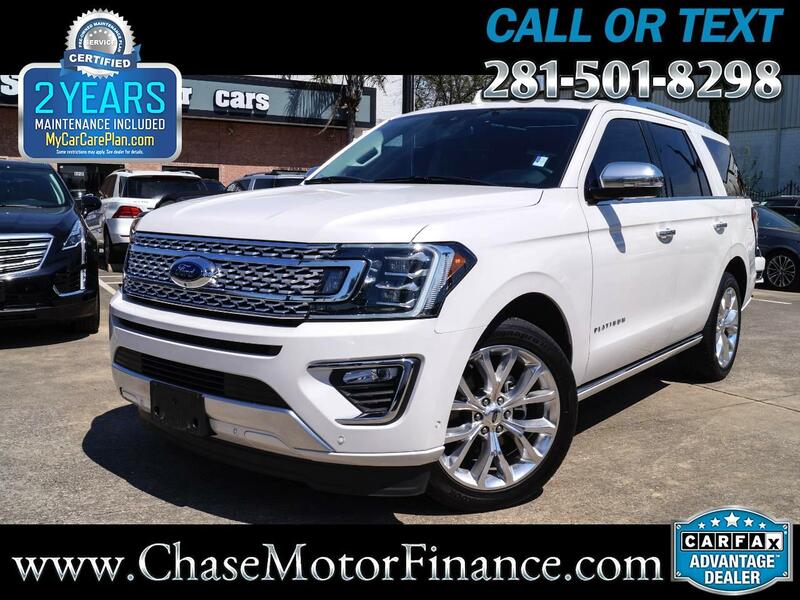 Chase Motor Finance is proud to present this *IMMACULATELY KEPT* 2018 1-OWNER, FORD EXPEDITION PLATINUM , Loaded! For sale we have this Gorgeous non-smoker Expedition! Finished in white paint and black leather interior, this vehicle has been kept in overall excellent condition! The paint has a healthy shine to it and the interior leather is spotless through and through. Vehicle is LOADED with options! Please refer to pictures and have a good look at this beautiful Platinum for your self! Keep in mind that this Lincoln holds the remainder of its factory warranty by Ford, fully transferable and bumper to bumper! Options Include: Navigation, Panoramic roof, Power 3rd Row Seats, Power Running Boards, Blind Spot assist, Front and side and rear Cameras, Traction Control, Dual A/C, Power Leather Seats, Heated Seats, Bang & Olufsen Premium Sound System, Am/Fm/CD/USB/AUX/Bluetooth, Memory Seat, Lumbar, Steering Wheel Audio Control, 20" Factory Wheels, Power lift Gate, Power Locks, Power Mirrors, Power Windows, Cruise Control, Front and rear Arm rest and many More! Our mechanics have thoroughly inspected this Ford and have found no mechanical problems! The drive is excellent, no shakes or pulls. The 3.5L V6 engine is responsive and the automatic transmission shifts smoothly into gears. Don't miss the chance to own this beautiful Expedition. Please feel free to contact us should you have any question!! !